I just recently decided to take a massive road trip across the USA. I travelled with my lovely life companion Christina (aka The Motherpreneur, Best Wife Of All and always up for new experiences) and our youngest son. We left from our home city of Vancouver, Canada to my hometown where I grew up Chattanooga, Tennessee. It’s not for the faint of heart as it’s a 9,000 km/5,600 mi. trip. We decided to enjoy the journey and spread out the travel time in order to soak up some of the awesome sites along the way. We broke up the driving over 4 nights/5 days both on the way to Chattanooga and on back home to Vancouver. We also kept it interesting by bringing along our tent. Two nights camping and two nights staying in a hotel. This was both fun and cost effective which appealed to my frugal nature. We used a great website called Trippy and followed their suggested route to a “T”. The site even makes suggestions of great places to eat which we decided to forego but we did follow the driving suggestions and I would highly recommend using this site if you ever take a road trip of massive proportions. The trip on the way down to Chattanooga went without a hitch. Our SUV purred along through a record heat wave keeping us cool and somehow avoiding speed traps. It also helped that the speed limit across parts of Idaho, Montana and South Dakota allows for 80 mph/130 km which keeps you chugging along at a good kip. We stayed overnight in Missoula Montana, Mt. Rushmore South Dakota, Omaha Nebraska, and St. Louis Missouri, before arriving in Chattanooga on our 5th day. It appeared that our return trip would give us the same luck. We travelled via Kansas City Missouri, Denver Colorado, Salt Lake City Utah but on our way to La Grande Oregon about 300 km/180 mi. away our low tire pressure light came on. We stopped and checked all the tires. Two of the tires seemed to be a bit low but nothing major so we added some air to be sure they were all at 30lbs pressure. When we got back on the road the low tire pressure light came back on after about 100 km. I drove a bit slower but didn’t bother to stop and check because I figured our excessive driving and the 95-degree Fahrenheit/ 35-degree Celcius heat was messing with the tire pressure as well as the gauges. I did slow down more than normal just in case I was wrong but I was determined to keep rolling along and our SUV’s handling seemed normal. Finally when we arrived at a small town called Baker City (in Oregon) which was about 50 mi. from our final nights stop in La Grande I pulled off to make a quick check on the tire pressure. This is when I could see that my left rear tire was obviously low and a quick pressure check confirmed it was at 15 lbs which is half of what it should be. I checked for any punctures and didn’t find or notice anything so I filled it up to 30 lbs and hoped that it would hold until we arrived in La Grande. When we got to our camping site I checked the tire pressure again and it had already gone back down to 15 lbs so I knew it was certainly going to be an issue. It was also starting to get dark so I asked my super travel companions if they could put up the tent while I change the tire as I didn’t want to wake up the next morning with a completely flat and ruined tire. I asked the wonderful owners of Grande Hot Springs RV Resort Michael and Tamrah if they knew of any tire repair centres in the area and they both said in perfect unison “Les Schwab.” Because of their strong recommendation, I decided to get up early and be the first in line at the store in the morning. I was also thinking about the worse possible scenario. We could possibly need a new tire and be told that it wasn’t in stock and would have to be ordered in special and of course, we would have to pay extra to get it in if at all before closing. We might have to stay another night and this would, of course, add to the cost and inconvenience of our just about perfect road trip. We were so close to home only one day left to go on our amazing 15-day journey. We were so close to the finish line but not quite there yet. I’m up at 6:30 am on Saturday and have time for a quick shower before heading into town. Christina wanted a ride in so she could go for a walk through the town and visit the Farmers Market while the tire was being repaired. I was pretty amazed to see a few customers had already arrived and were already in the shop when we arrived at 7:45 am. I really didn’t think this to be the case because the Saturday opening times said 8:00 am? I had expected to be waiting for the manager to arrive at the door. When we walked in the coffee was already brewed and there was fresh popcorn available. The assistant manager Ryan Givens greeted me with a smile as I told him about our long journey and how we almost made it home without a mishap. He just smiled and said they would take a look and hopefully we’d be good to go very shortly, maybe about an hour. When I rolled the tire in I noticed there was something rattling inside and we both just shook our heads in bewilderment? It sounded and felt like a large object of some sort inside the tire. I sat down at a comfortable table, sipped a nice fresh cup of coffee, munched on some tasty popcorn and read the local newspaper. Every once in awhile I would take a look around the shop and noticed people coming in and having nice conversations. The staff were busy but laughing and smiling as they went about their work fixing tires, balancing wheels, and helping customers. I was in shock. Did they not realize that I was a transient customer? I’m not a local. I have a Candian License plate. There is absolutely zero chance that I could become a repeat customer. I did not buy my tires at their shop. The nice young lady sitting at one of the desks said, “Have a safe rest of your journey back home”. This was also a pleasant shock for me because I wasn’t even aware that she was within ear shot when I spoke with Ryan when I first came in. There were other people in the shop at the time and it appeared to me that she was busy at her desk. This little tire shop in La Grande Oregon ended up being the icing on top of the final day of our road trip journey and I will never forget this amazing customer service experience. I will probably tell 100’s of people about this tire shop when I talk to them about our amazing USA road-trip. My wife will probably tell quite a few others and my 14-year-old son knows about the awesome tire shop called Les Schwab Tires in La Grande, Oregon. Now that I’ve been back home for a few days and had a chance to go and check their website, I see that Les Schwab has been around since 1952. Here’s a few words from their website that I was not surprised to find after my wonderful experience. The friendly greeting you get when you visit Les Schwab Tire Centers isn’t a gimmick. It’s how we do business, and always have. Sure, we’ve grown, but our aim is still to be like a hometown neighbor—reliable, valued, trustworthy. 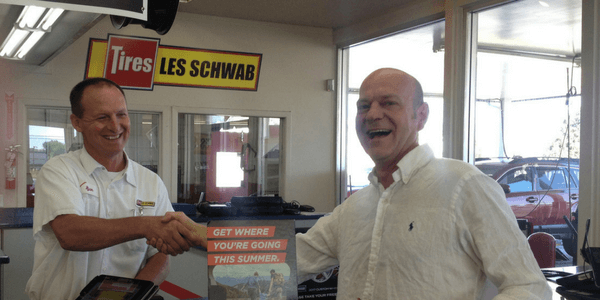 This service ethic is what’s behind the growth Les Schwab Tire Centers has enjoyed over the course of more than 60 years. With over 450 locations, we’re one of the largest independent tire dealers in the country. And we’re like no other. I deliver my blog every Tuesday to your inbox. 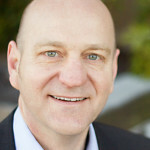 You will also receive a FREE Sales Boost Training Video when you Subscribe. I look forward to connecting with you. 3 replies to "Going Flat"